Increasing hype of density of outdoor pollution by media, declining prices and growing awareness have led for the growth of India air purifier market revenues. Although, the market of air purifiers is very niche currently, but is likely to register exponential growth rate in the coming years. In addition, rising disposable income along with changing lifestyle have spurred the demand for air purifiers in the country. According to 6Wresearch, India air purifier market size is projected to grow at a CAGR of 30% during 2017-23. India air purifier market is mainly an import driven market with both domestic and international players importing their products. Air purifiers with HEPA and Carbon filters have captured key share of the market in 2016; however, its share is expected to decline during the forecast period owing to advancement in technology and increase in number of filters in air purifiers. At present, residential sector is dominating the market with maximum revenue share in the overall India air purifier market share due to increasing concerns of indoor air pollution. In 2016, tier 1 cities have contributed for major share in the air purifier market, where major demand is coming from northern part of the country. India air purifier market report thoroughly covers the market by air purifier by segments, types, applications, and regions. 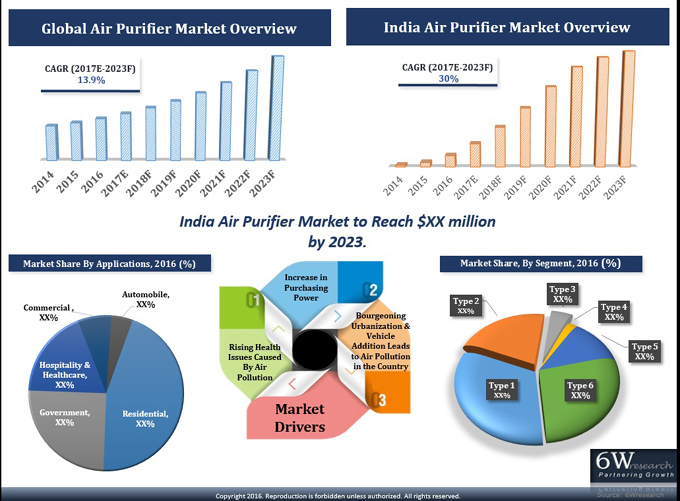 India air purifier market outlook report provides unbiased and detailed analysis of the on-going India air purifier market trends, opportunities/high growth areas, market drivers, which would help stakeholders to device and align market strategies according to the current and future market dynamics. • Historical and Forecast data of Global Air Purifier Market Revenue for the Period 2014-2023F. • India Air Purifier Market Size and India Air Purifier Market Forecast Revenues until 2023. • Historical and Forecast data of India Air Purifier Market Revenue for the Period 2014-2023F. • Historical and Forecast data of India Air Purifier Market Volume for the Period 2014-2023F. • Historical and Forecast data of Car Air Purifier Market Revenue for the Period 2014-2023F. • Historical and Forecast data of Car Air Purifier Market Volume for the Period 2014-2023F. • Historical and Forecast data of Room Air Purifier Market Revenue for the Period 2014-2023F. • Historical and Forecast data of Room Air Purifier Market Volume for the Period 2014-2023F. • Historical and Forecast data of India Type I Air Purifier Market Revenue for the Period 2014-2023F. • Historical and Forecast data of India Type I Air Purifier Market Volume for the Period 2014-2023F. • Historical and Forecast data of India Type II Air Purifier Market Revenue for the Period 2014-2023F. • Historical and Forecast data of India Type II Air Purifier Market Volume for the Period 2014-2023F. • Historical and Forecast data of India Type III Air Purifier Market Revenue for the Period 2014-2023F. • Historical and Forecast data of India Type III Air Purifier Market Volume for the Period 2014-2023F. • Historical and Forecast data of India Type IV Air Purifier Market Revenue for the Period 2014-2023F. • Historical and Forecast data of India Type IV Air Purifier Market Volume for the Period 2014-2023F. • Historical and Forecast data of India Type V Air Purifier Market Revenue for the Period 2014-2023F. • Historical and Forecast data of India Type V Air Purifier Market Volume for the Period 2014-2023F. • Historical and Forecast data of India Type VI Air Purifier Market Revenue for the Period 2014-2023F. • Historical and Forecast data of India Type VI Air Purifier Market Volume for the Period 2014-2023F. • India Air Purifier Market Trends. • India Air Purifier Market Overview on Competitive Landscape. 11.2	Blueair India Pvt. Ltd.
11.3	Crusaders Technology (I) Pvt. Ltd.
11.4	Daikin Air Conditioning India Pvt. Ltd.
11.6	Honeywell Automation India Ltd.
11.8	Panasonic India Pvt. Ltd.